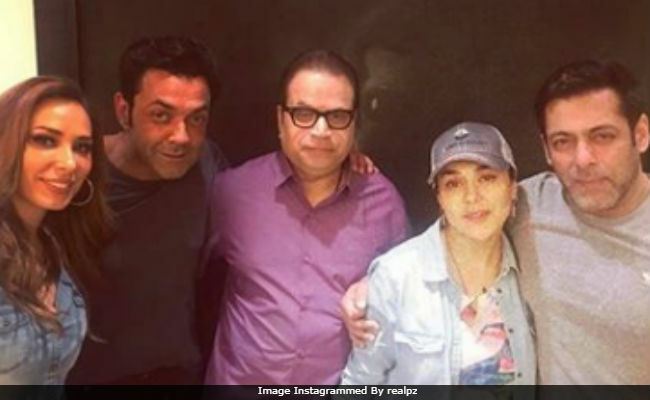 Actress Preity Zinta, who turned 43 today (January 31), celebrated her birthday last night with Salman Khan, Iulia Vantur (his rumoured girlfriend), Bobby Deol, Sonakshi Sinha, film producer Ramesh Taurani and other friends. Preity posted a picture collage from last night's celebrations and wrote, "Thank you all for all the wonderful birthday wishes. So humbled and so touched by all the good wishes. Loads of love!" adding hashtags like "Unplanned Get Together" and "Friends Forever." Salman Khan and Bobby Deol are currently filming Ramesh Taurani's Race 3, directed by Remo D'Souza. Preity has worked with both Salman and Bobby Deol previously. Here's the picture which she posted. With Salman, Preity has starred in several films such as Har Dil Jo Pyar Karega..., Chori Chori Chupke Chupke, Jaan-E-Mann and Dil Ne Jise Apna Kahaa. She last featured with him in a special song sequence for Main Aurr Mrs Khanna. Bobby Deol was Preity's co-star in Soldier and Heroes. And, about a decade later, the duo starred together in Jhoom Barabar Jhoom. She has also worked with Bobby's actor brother Sunny Deol in Farz and The Hero: Love Story of a Spy. Preity will now feature in a special dance sequence in Sunny Deol's forthcoming film Bhaiyyaji Superhitt. Preity Zinta's Instagram account has several pictures of the actress with Iulia Vantur, a Romanian TV presenter. She recently made her singing debut. Preity Zinta married Gene Goodenough in an extremely private ceremony in Los Angeles in February 2016. She has not made any big screen appearances after 2013's Ishkq In Paris. She co-owns Kings XI Punjab, an Indian Premier League (IPL) team.